CALGARY, Oct. 30, 2018 /CNW/ – Inter Pipeline Ltd. (“Inter Pipeline”) (TSX: IPL) announced today that its European storage subsidiary, Inter Terminals Ltd., has entered into an agreement to acquire 100 percent of the issued share capital of NuStar Energy, L.P.'s European bulk liquid storage business (“NuStar Europe”) for cash consideration of USD$270 million, or approximately CAD$354 million. The transaction is expected to close in the fourth quarter of 2018 and is subject to customary closing conditions. Strong integration potential with Inter Terminal's existing terminals in the UK, resulting in enhanced product storage and custom blending solutions for customers. In the UK, the 1.9 million barrel Grays terminal is strategically located on the River Thames and serves the greater London area. Grays is a key regional supply point, responsible for handling approximately 17 million barrels of refined products per year, and provides cost effective access to London's fuel distribution network. 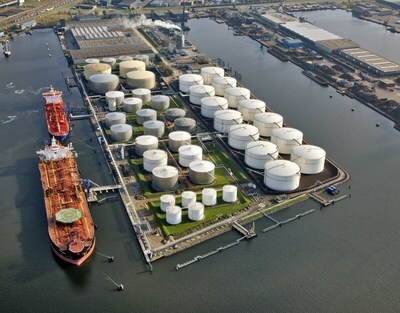 The 49 tank terminal has averaged approximately 100 percent utilization over the past three years. Concurrent with the acquisition, Inter Pipeline has entered into an agreement with a syndicate of underwriters whereby they will purchase from Inter Pipeline, on a bought deal basis, 9.62 million common shares at a price of $20.80 per common share for total gross proceeds of approximately $200 million (the “Offering”). The common shares will be issued under Inter Pipeline's short form base shelf prospectus dated January 18, 2018, and a prospectus supplement to such short form base shelf prospectus to be filed on or before October 31, 2018 in each of the provinces of Canada. The Offering is being led by TD Securities Inc. as the sole bookrunner, and co-led by BMO Capital Markets. For further information on the NuStar Europe acquisition, please refer to a slide presentation available on Inter Pipeline's website at www.interpipeline.com or at www.sedar.com. Certain information contained herein may constitute forward-looking statements that involve risks and uncertainties. Readers are cautioned not to place undue reliance on forward-looking statements, including, but not limited to, statements regarding the anticipated benefits of the NuStar Europe acquisition and growth opportunities associated with the NuStar Europe acquisition including, without limitation, NuStar Europe's annual average EBITDA over the next several years,, the completion, size, funding and timing of the NuStar Europe acquisition and the completion, size and timing of the offering of common shares. Such statements reflect the current views of Inter Pipeline with respect to future events and are subject to certain risks, uncertainties and assumptions that could cause the results of Inter Pipeline to differ materially from those expressed in the forward-looking statements. Factors that could cause actual results to vary from forward-looking information or may affect the operations, performance, development and results of Inter Pipeline's businesses include, among other things: risks relating to closing of the NuStar Europe acquisition; the potential for undisclosed liabilities associated with the NuStar Europe acquisition and realizing the expected benefits from the NuStar Europe acquisition; risks and assumptions associated with operations, such as Inter Pipeline's ability to successfully implement its strategic initiatives and achieve expected benefits. With respect to the anticipated benefits from the NuStar Europe acquisition and statements with regards to NuStar Europe's annual average EBITDA over the next several years, such factors also include, but are not limited to: synergies may not be realized in the time frame anticipated, the ability to promptly and effectively integrate the businesses, reputational risks, and diversion of management time on acquisition-related matters. Such information, although considered reasonable by Inter Pipeline at the time of preparation, may later prove to be incorrect and actual results may differ materially from those anticipated in the statements made. For this purpose, any statements that are not statements of historical fact may be deemed to be forward-looking statements. Forward-looking statements often contain terms such as “may”, “will”, “should”, “anticipate”, “expects” and similar expressions. Such risks and uncertainties include, but are not limited to, risks associated with operations, such as loss of markets, regulatory matters, environmental risks, industry competition, potential delays and cost overruns of construction projects, and the ability to access sufficient debt or equity capital from internal and external sources. You can find a discussion of those risks and uncertainties in Inter Pipeline's securities filings at www.sedar.com. The forward-looking statements contained in this news release are made as of the date of this document, and, except to the extent required by applicable securities laws and regulations, Inter Pipeline assumes no obligation to update or revise forward-looking statements made herein or otherwise, whether as a result of new information, future events, or otherwise. The forward-looking statements contained in this document are expressly qualified by this cautionary note. Certain financial measures referred to in this news release including EBITDA are not measures recognized by Canadian generally accepted accounting principles (GAAP), as outlined in the Chartered Professional Accountant (CPA) Handbook Part I, and used by management to evaluate the performance of Inter Pipeline and its business segments. Since certain non-GAAP financial measures may not have a standardized meaning, securities regulations require that non-GAAP financial measures are clearly defined, qualified and reconciled with their nearest GAAP measure. See the “Non-GAAP Financial Measures” section in Inter Pipeline's most recently filed management's discussion and analysis available at www.sedar.com for further information on the definition, calculation and reconciliation of non-GAAP financial measures.